Widely accessible and highly addictive, cocaine is one of the most serious substance abuse threats that the U.S. currently faces. Overcoming addiction to cocaine is possible with the right support system and in a safe environment dedicated to recovery. While cocaine addiction currently impacts many regions of the United States, many individuals are unaware of the full scope of the problem. This lack of accessible information can make it difficult for loved ones to recognize when a friend or family member is struggling with cocaine addiction. In reality, cocaine addiction comes in many forms and has severe consequences for those who continue abusing the substance. Insufflation: Individuals most commonly ingest cocaine in its powder form by snorting it into the nasal cavity. Once snorted, the powder is naturally absorbed into the bloodstream. Consumption: It is common for those abusing cocaine in its powder form to consume the substance orally. Users will rub cocaine directly onto their gums to experience its effects more rapidly. Inhalation: Cocaine is commonly processed into a rock crystal, colloquially referred to as “crack” or “crack rocks,” to streamline sale and distribution. Crack is ingested by burning the crystal and inhaling the subsequent vapors. Cocaine is especially dangerous compared to other commonly abused illegal drugs because of its deadly combination of short- and long-term health impacts. The rapid onset of physical dependency and severe withdrawal symptoms that characterize cocaine abuse make it very difficult to convince an individual to stop taking the drug after unhealthy patterns have already begun. Those who begin experimenting with cocaine do so for the substance’s short-term benefits. Unfortunately, it doesn’t take much before this pattern of behavior becomes addictive. Even worse, long-term abuse of cocaine carries with it multiple debilitating health risks, ranging from a loss of sense of smell to life-threatening bowel decay. More than 1.5 million Americans aged 12 or older used cocaine in 2014 alone, according to the National Survey on Drug Use and Health (NSDUH). Cocaine overdose deaths across the nation saw a significant increase from 2010 to 2015, according to the National Institute on Drug Abuse (NIDA). The 2011 Drug Abuse Warning Network (DAWN) report noted that 1 in 3 illicit drug-related emergency department visits nationwide involved cocaine. A 2016 NIDA study found that nearly 4 percent of high school seniors reported using cocaine at least once in their lives. While addiction poses a major threat to public health nationwide, each state has its own unique challenges when it comes to substance abuse. Roughly 3 percent of high school students in Maryland have used cocaine one or more times, according to the U.S. Department of Health and Human Services. Statewide cocaine-related deaths have increased annually since 2014, as reported by the Maryland Department of Health and Mental Hygiene. 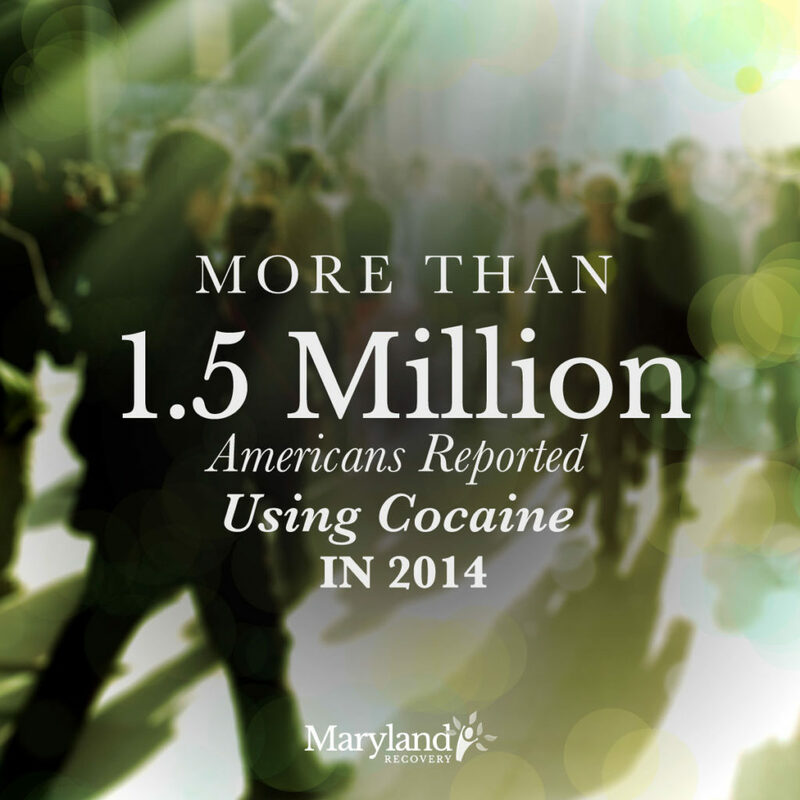 Cocaine deaths among Marylanders aged 45 to 54 years old are on the rise in recent years, especially among men. Acute withdrawal from cocaine usually lasts one to three weeks. Cocaine remains in the body for an estimated 72 hours after usage. While a urine test can identify the presence of cocaine at this time, traces can be detected in urine for up to 12 weeks in cases where the individually chronically abused the drug. How Long Does Cocaine Addiction Treatment Take? Inpatient cocaine treatment can last between 30 and 90 days and is ideal for individuals with moderate to severe cocaine addictions. Extended cocaine programs tend to last 90 days or longer and are for those struggling with serious cocaine dependence, such as those who have used cocaine for many years. Outpatient treatment programs exist for cocaine users with mild addictions. While the standard timeline for outpatient programs for cocaine addiction is 10 to 16 weeks, many individuals continue to benefit from attending outpatient programs for as long as one to two years. What Are the Risks Of Using Cocaine with Other Substances? The National Institute on Drug Abuse reports the combination of cocaine and alcohol prompts the body to cultivate a chemical known as cocaethylene, which has the potential to cause sudden death. What Are the Symptoms of Cocaine Overdose? What Are Some Common Mental Illnesses Related to Cocaine Abuse? Many individuals who struggle with addiction exhibit symptoms of mental illnesses, such as major depressive disorder (MDD) or generalized anxiety disorder (GAD). Research indicates that mental illness can lead to substance abuse, as many individuals gravitate toward drugs as a way to self-medicate and alleviate unpleasant symptoms. For example, those suffering with anxiety or depression might turn to cocaine to find relief from the turmoil of their condition. Substance abuse can prompt symptoms of other mental illnesses to emerge in users, as well. Prolonged cocaine use can lead to severe paranoia, in which the user loses touch with reality and experiences auditory hallucinations. What Are the Common Chronic Illnesses and Diseases that Stem from Long-Term Cocaine Use? Longtime cocaine users are also at an increased risk for developing neurological and cognitive problems with the brain’s executive functioning abilities. This could impair an individual’s capacity to make decisions, control impulses, maintain concentration, remember information and finish motor tasks. How Does Cocaine Abuse Effect Family Relationships? Substance abuse often makes individuals act in ways that hurt those they love the most, which is why cocaine addiction can have a variety of negative effects on a user’s relationship with his or her family. Cocaine users often engage in isolating behaviors and withdraw from their families to spend time using. This can cause family members to feel hurt and grow concerned about the well-being of their loved one. Cocaine abuse may also cause someone to steal from relatives as a means of funding their addiction, or lie to hide their condition from their families. These actions can cause permanent damage to the trust family members have in a cocaine user. Family members of cocaine users also tend to feel guilty about their loved one’s condition, and may even start to blame themselves for the issue. Other times, family members grow resentful when the cocaine user refuses to face the reality of the disease. Either way, family members are encouraged to begin receiving their own form of counseling once the loved one finally undergoes treatment for the cocaine addiction. Maryland Recovery’s approach to addiction recovery focuses on making sure that clients are fully prepared to return to their daily lives following treatment. In Bel Air, Maryland, we specialize in providing the highest level of long-term care to our patients, including the ability to treat dual diagnosis individuals. By using evidence-based treatment methods along with holistic modalities over the course of three months or more, we offer our patients a unique opportunity to end their battle with cocaine addiction for good.